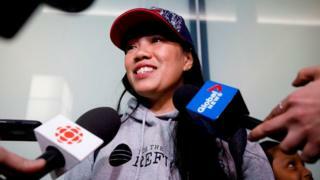 The 42-year-old says she is now "safe and free" and will settle in Montreal. Upon arrival in Toronto, Ms Rodel told the South China Morning Post: "When I heard 'Welcome to Canada,' it just put a big smile on my face. "My life has changed. I am so excited that now we can even eat some food outside. I want to try maple syrup and do skating in the snow in Montreal with my daughter." He said: "Thank you to all those in Canada and around the world who have made this possible. After so many years, the first of the families who helped me is free and has a future. But the work is not over - with solidarity and compassion, Canada can save them all." Five other refugees who took him in remain in Hong Kong and have asked Canada for asylum. Their lawyer Robert Tibbo previously told the BBC that he decided to place Mr Snowden with the refugees as the area they lived in would be "the last place that anybody would look" for him. Mr Snowden released tens of thousands of secret documents revealing the extent of government mass surveillance from America's NSA and Britain's GCHQ.